Infinity Optical system design, as a basis is an important development in optical performance and versatility. A good solution of chromatic aberration. In Infinity Optical System there are accessories designed including,darkness,, phase contrast accessories, polarizing kits, and fluorescent light, etc. to fit different customer needs. BAB Microscopes are produced in our own constitution, except All The optics. Our microscopes, has a object tray locking system to avoid the lenses crash and deformation of the objects. The microscopes has Trinocular hood that gives a ergonomic use with 30 degrees.The distance between the forehead and eyes in the Trinocular hood is 50-76mm. Please tell if your choice is 45 degrees. Our microscope has a double super-wide-field 10X worth eyepieces.Oculars F.N value is 22.There are diopter adjustment on left ocular compartment. Our microscope has a revolver that features 5-slot objective, turn the infinite through the ball bearings, each lens mount stopper. The inner side of the objective lens to the body other than the study looks at the position has been designed. Our microscope has the "INFINTY AKROMAT PLAN" lenses and the lenses are in the following values.With these lenses, Fluorescent, with bright, dark, makes the work without changing. Mikroskobumuzun 2 samples at the same time holding the forward-backward and right-left-moving mechanical carrier divisions are in millimeters. Threaded metal and durable. 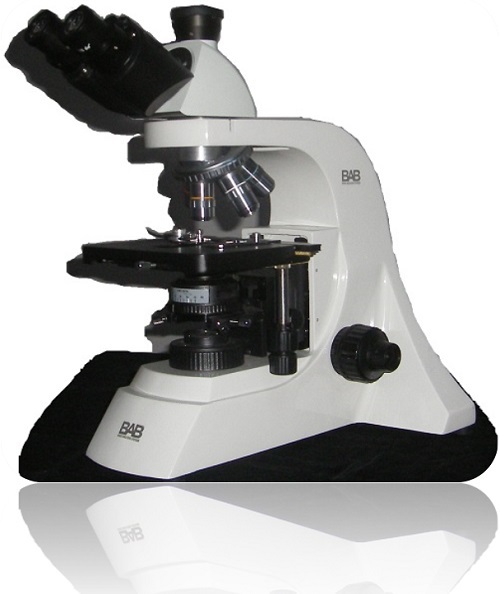 Microscope focusing, on both sides of the body is made by coarse and fine Handles. Fine focusing accuracy in the range of about 1 micron. Coarse focusing knobs and brake system rigidity is adjustable. Abbe condenser: NA = 1.25, adjusted Swing-out condenser type is achromatic. This is the height of the microscope condenser and right, with both buttons must be set separately by the left. But if you want to use the 100w halogen lamp, halogen lamp produces 1950 lumens of light and life is too short to LED lamp ..